The world premiere of the BMW i3 Concept Coupe sees the BMW Group unveil a particularly nimble and emotive version of its concept for sustainable premium-class motoring with zero local emissions. 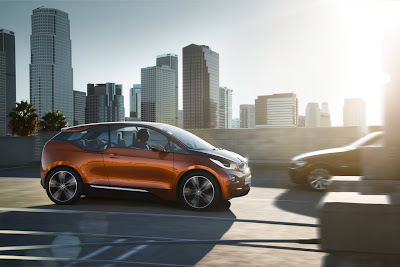 The study presented at the 2012 Los Angeles Auto Show has been brought out in parallel to the ongoing development process for getting the first ever all-electric model from the BMW i brand ready for series production, and demonstrates the potential for conceivably extending the model range. 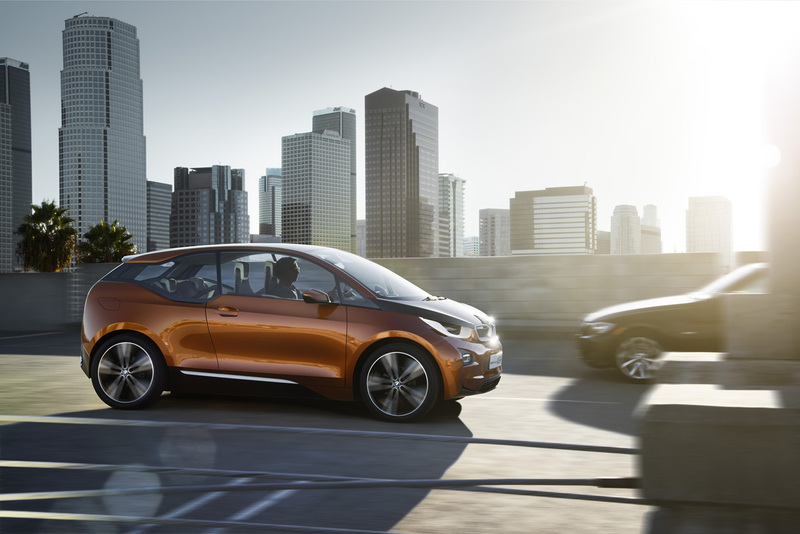 The state-of-the-art, clean-cut and open design showcased by the BMW i3 Concept Coupe represents a pioneering form of urban mobility that makes sustainability awareness an intrinsic part of the premium profile. Beyond this, the three-door model employs the design idiom that has been created especially for the BMW i cars to convey an undeniable sense of dynamism and driving pleasure. The carbon-fibre body's visual impact is largely shaped by the gracefully flowing coupe roof line and the fresh interpretation of the BMW i "stream flow" design that can be seen in the side window styling, and gives an instant impression of lightness, transparency and streamlined aerodynamic qualities. On the inside, the sense of spaciousness typical of the BMW i brand is combined with an exclusive lounge-style ambience in the two individual rear seats. The BMW i3 Concept Coupe furthermore assumes the title of the world's first fully networked electric vehicle. Thanks to the inclusion of innovative BMW ConnectedDrive functions that have been devised by BMW i for use in production vehicles, operation of the navigation system as well as the information transfer between the vehicle, the outside world and the driver's smartphone has been geared towards the specific requirements of e-mobility. 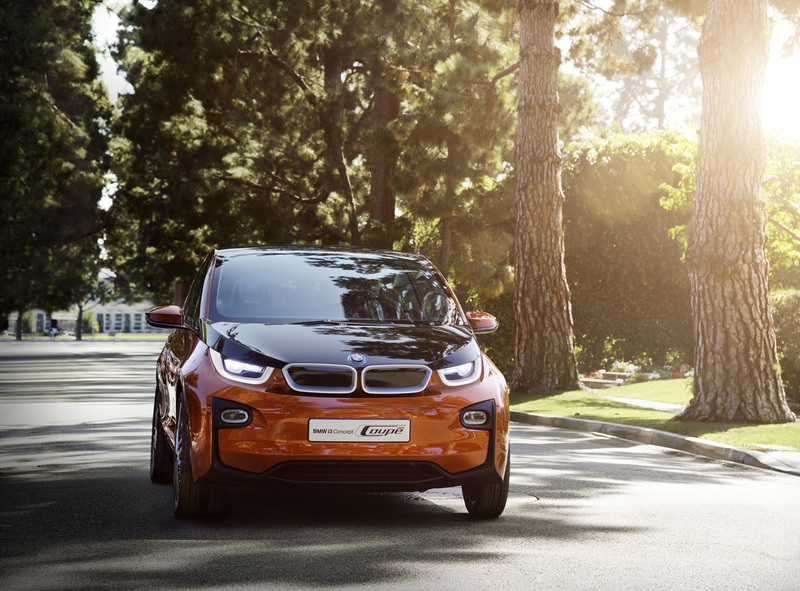 The BMW i3 Concept Coupe sharply focuses the spotlight on the dynamic performance that can be achieved with the purely electric version of the BMW eDrive technology. 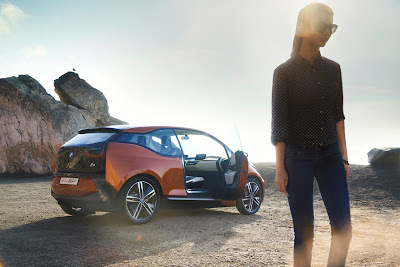 Like the BMW i3 Concept, the Coupe is also propelled by an electric motor developed by the BMW Group, which develops a maximum output of 125 kW/170 hp and peak torque of 250 Newton metres (184 lb-ft), and channels its instantaneous power delivery to the rear wheels via a single-speed transmission. The electric motor draws its energy from the lithium-ion storage cells under the floor. Positioning the battery units here has the effect of lowering the centre of gravity considerably, which further adds to the vehicle's sensationally agile handling. Body design: LifeDrive architecture sporting new look and colour scheme. Transferring the design idiom developed specifically for BMW i cars to a coupe concept has resulted in a body whose styling smacks of fun at the wheel while still plainly signalling sustainable mobility. The BMW i3 Concept Coupe's looks let the brand values of efficiency, lightness, safety and premium quality clearly shine through, along with the study's distinctly dynamic bias. The exterior surfaces and colour scheme are structured in such a way as to visualise the basic construction defined by the LifeDrive architecture. The principle of overlapping levels known as "layering" serves to symbolise the harmonious interaction between the striking construction and design elements of the Life and Drive modules, as well as providing the basis for a transparency in the vehicle design that reinforces the concept's sustainability. For instance, the structure of the carbon-fibre material employed in the Life module can be clearly seen in the entrance area and the roof pillars when the door is opened. It is here, as the two-dimensional CFRP laminate typically used for load-bearing elements comes into view, that the material's composition becomes particularly apparent. The bodywork panels around the wheel arches, doors and rear sidewalls are painted in Solar Orange metallic, a warm shade bursting with energy that was created especially for the BMW i3 Concept Coupe. It forms an electrifying contrast with the high-gloss black finish on the bonnet, roof and boot lid, as well as with the body's black lower edge. The front apron includes black embedded elements designed to create an air curtain effect that carefully directs the airflow in the vicinity of the wheel arches. The rear apron's lower section incorporates a diffuser component to optimise flow conditions towards the rear of the vehicle's underside. 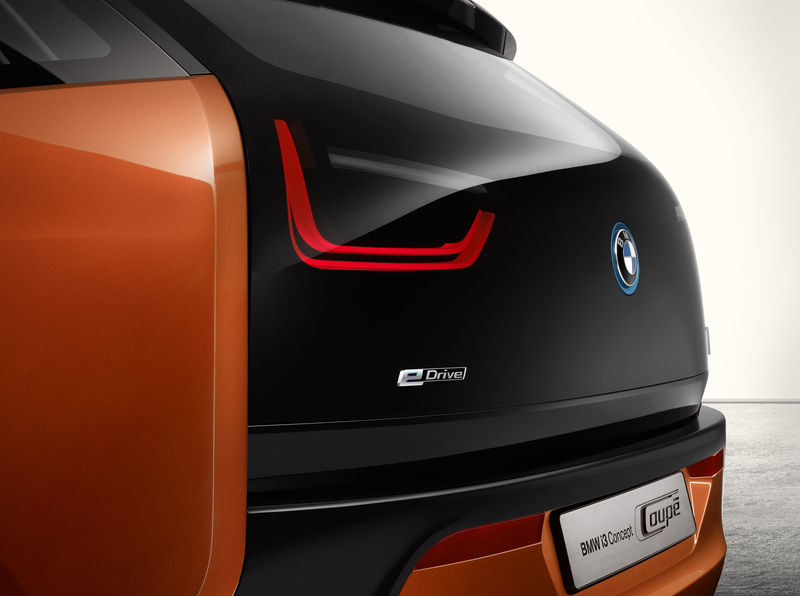 The licence plate holder features a narrow border in Solar Orange, while the U-shaped rear light clusters are integrated into the rear window, just as they are on the BMW i3 Concept. Contrasting touches of Frozen Grey matt for the BMW kidney grille and the sill lines along the sides are specific to this model and add to its visual appearance. The brand emblems in Stream Blue at the front and rear and on the wheel hubs are characteristic BMW i features. Innovative coupe lines spell pure driving pleasure. A steeply raked windscreen that extends a long way forward and a roof line that descends gently into the vehicle's tail are the defining features of the BMW i3 Concept Coupe silhouette. The long doors with frameless windows also have a typical coupe feel to them. The specific way in which a CFRP passenger cell is constructed means there is no need for a B-pillar. Not only does this facilitate access to the rear seats, it gives extra impact to the dynamic flow of lines visible in the window styling. The BMW i3 Concept Coupe includes a fresh interpretation of the brand's hallmark "stream flow" design for the side window contours between the doors and the C-pillars. As a result of the enclosed body concept around the doors and the rear sidewalls, the ratio between the body's basic structure and the window area is clearly marked by the shoulder line. The latest version of the window outline tapers sharply towards the rear, once again putting clear emphasis on the vehicle's excellent aerodynamic properties. 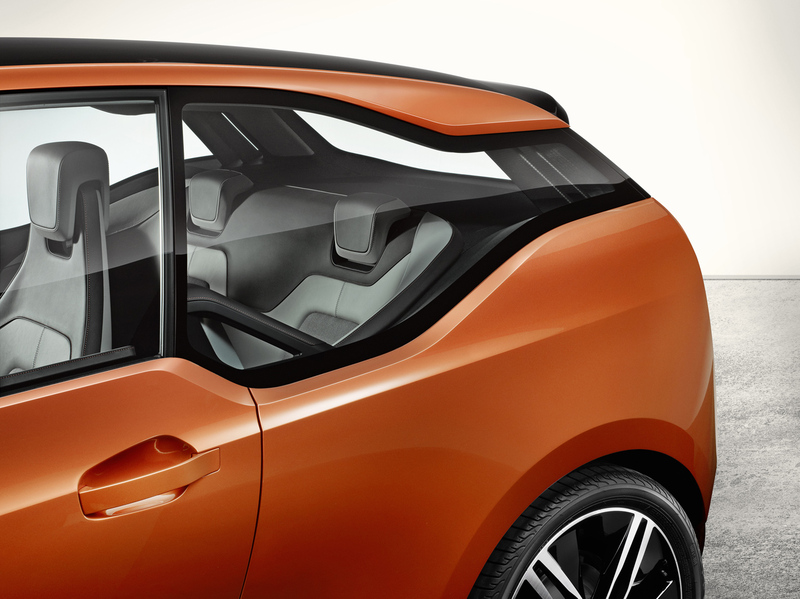 The upper and lower edges are spaced particularly far apart on the BMW i3 Concept Coupe, producing an enlarged window area at the rear. This means that, in contrast to conventional coupes, passengers in the rear compartment are able to enjoy a remarkable sense of spaciousness and feel far more involved in the driving experience. The highly distinctive and dynamic view of the BMW i3 Concept Coupe in profile is completed by the gently rising swage line on a level with the door openers, as well as a striking character line that produces an intriguing interplay between light and shade just above the side sills. The exterior mirrors also sport a design that's specific to this model, with black mirror bases and caps in Solar Orange metallic that pick up on the body's overall colour scheme. 20-inch light-alloy wheels in double-spoke design further intensify the car's sporting aura. As is customary for BMW i models, they are shod with comparatively narrow, reduced rolling-resistance tyres measuring 155/60 R20 at the front and 175/55 R20 at the rear. 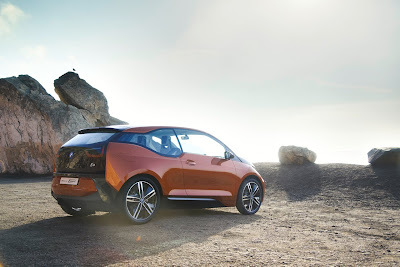 All in all, the even more purist interpretation of the design idiom compared to the BMW i3 Concept, coupled with the more horizontal focus of the exterior's styling, highlights the car's enhanced aerodynamic properties. The BMW i3 Concept Coupe therefore epitomises the future of urban mobility, at the same time as instilling it with a distinct sense of sportiness and emotional appeal. Interior: inviting, spacious, clear-cut and inspiring. Individual styling and material selection ensure that the brand's trademark principles of sustainability, lightness and transparency are applied to genuine effect in the interior design of BMW i models, too. 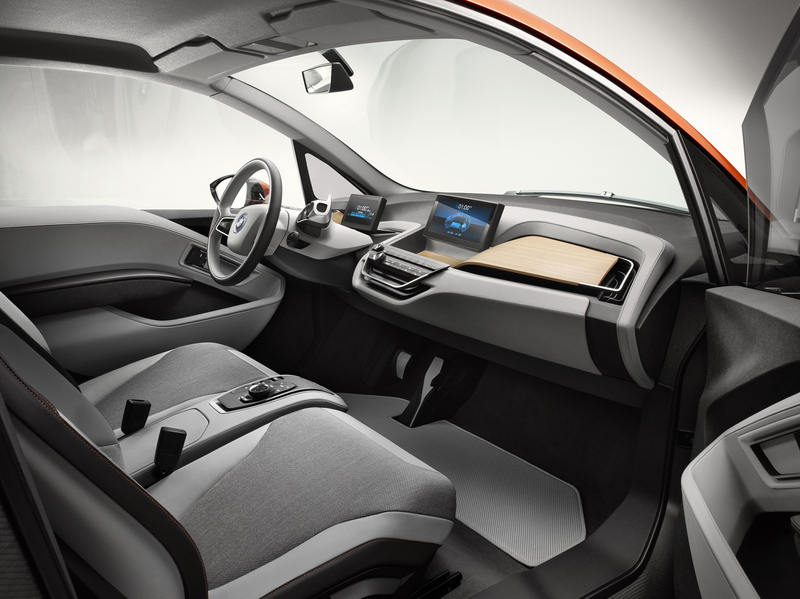 The interior of the BMW i3 Concept Coupe illustrates how the cockpit design has evolved as it is readied for series production, while at the same time creating an individual ambience that fits in with the concept of a sporty three-door car. The layering structure employed for the exterior once again underpins the arrangement of the function elements and controls, while a mixture of leather, wood, wool and other renewable raw materials ensures that the car's premium characteristics, including the new aspect of sustainability, can be both plainly seen and felt. The freestanding steering column's two-part design with its light and graceful feel is further accentuated by the colour scheme. All supporting elements are finished in a light grey colour, whereas the steering wheel's outer grip areas and all controls are coloured black. Besides the display that acts as the instrument cluster and the control stalks for the direction indicators and windscreen wipers, the steering column is also home to the electronic gearshift lever and the Start-Stop button. Above the steering column and behind the instrument cluster, there is a horizontally mounted wooden panel that spans the full width of the interior in a dynamic sweep. Sourced from certified sustainably managed European forests and treated using natural materials, the light eucalyptus wood adds a real touch of class, and is made all the more noticeable by the contrast with the black, three dimensionally shaped controls. The control panels on either side of the steering column are bordered by brushed aluminium accent strips. The sweeping design of the eucalyptus wood panel is echoed by the contour of the armrests in the doors, meaning that the driver and front passenger are encircled by a series of harmoniously styled surfaces. At the cockpit's centre, the bottom of the dashboard terminates in a flat control panel that is angled slightly towards the driver and is used to operate the climate control and audio functions as well as housing the favourite buttons for the iDrive system. The iDrive Controller and direct menu control buttons are located on the centre console between the driver and front passenger on a level with the seat cushions. The BMW i3 Concept Coupe has also kept the area between the dashboard and seat cushions completely clear across the cockpit's entire width. Its particular drive concept, furthermore, dispenses with the need for the transmission tunnel normally found on conventional vehicles, resulting in a completely open space connecting the left and right footwells. Not only does this create an impression of roominess, it can be of practical benefit, too, as it allows the driver to easily swap to the front passenger seat and get out on that side – a real boon, for example, when using city-centre parking spots so tight that the driver's door cannot be opened. Sustainability blended with sophistication: surfaces made from renewable resources and naturally treated materials. The manually adjustable seats with integrated head restraints that were specially designed for the BMW i3 Concept Coupe are upholstered in a blend of warm-toned textured wool yarn and a cool-looking monofilament material. The elegant, sporty colour scheme's light grey tones also reflect the sustainable character of the natural materials. The door support panels made from anthracite-coloured kenaf fibre are perfectly in keeping with this, and also blend harmoniously with the doors' leather trim panels. The leather adorning the interior of the BMW i3 Concept Coupe is treated using natural products exclusively, with an extract from the leaves of the olive tree serving as the tanning agent. There are two individual seats in the rear of the BMW i3 Concept Coupe where passengers are able to savour a whole new form of motoring comfort in a lounge-style ambience. The seat backrests both curve outwards prominently to form a seamless connection with the rear panelling. Whereas the seating position engenders a feeling of security, the windows – which are exceptionally large for the rear of a coupe – make passengers there feel more part of the driving experience. After tilting the front seat backrests forwards, getting in and out of the rear is facilitated by leather-trimmed grab handles that double as belt feeders for the driver and front passenger. Display and control concept featuring the very latest display technology. The BMW i3 Concept Coupe comes with two top-class displays, which provide the interfaces for the exchange of information between vehicle and driver and for operating the infotainment and communications functions. Information that can help to make driving a more comfortable, efficient and safe experience is flashed up in the displays. The navigation system, meanwhile, is networked with the outside world via BMW i ConnectedDrive. Information is visualised in the form of three-dimensional, high-resolution graphics depicted in the reduced style typical of the BMW i brand. The task of the instrument cluster is assumed by a 6.5 inch (16.5 centimetre) screen positioned on the steering column, where all driving-related information appears in digital form. The second display in the centre of the dashboard is positioned at exactly the same height for perfect legibility. With a screen diagonal of 8.8 inches (22.4 centimetres), it enables detailed graphics to be reproduced, just like the central information display in BMW production cars. This screen is used, for instance, to display the functions of the navigation system including the BMW i ConnectedDrive services. The information provided by the functions familiar from BMW ConnectedDrive is likewise shown here. This central information display also serves to keep the driver and front passenger fully informed of the vehicle's status and the drive system's operating mode. The two displays have been designed to interact in such a way that the information shown is distributed between the two screens as the situation dictates. In the case of the BMW i3 Concept Coupe, their interaction is best illustrated by a typical urban mobility scenario. When the car is started, the instrument cluster springs to life first. It signals that the vehicle is ready to start with a welcome sequence whose animation spreads to the central information display. In the meantime, the system has already connected to the drive's smartphone and is showing current calendar entries. Shortly afterwards the driver receives a text message with the agreed venue for his meeting. The address data are automatically used to generate a navigation destination, which then appears on the central information display. The driver learns that his destination is within the vehicle's range and he is advised to recharge the car there. Shortly before arrival at the destination, various charging stations in the vicinity are displayed and the driver is offered the option of booking one of them. He confirms and books the nearest one. During the journey the driver can also find out about the restaurant he is heading for as well as listening to personal playlists. On arrival, the driver hooks the vehicle up to the charging station. The illustration of the different functions is rounded off by an animated charging graphic that appears on both displays when recharging the battery. COMFORT, ECO PRO and ECO PRO+: three driving modes for the ideal mix of driving pleasure and efficiency. The range covered by vehicles with an all-electric drive is very much dependent on driving style, just as fuel consumption is in conventionally powered cars. 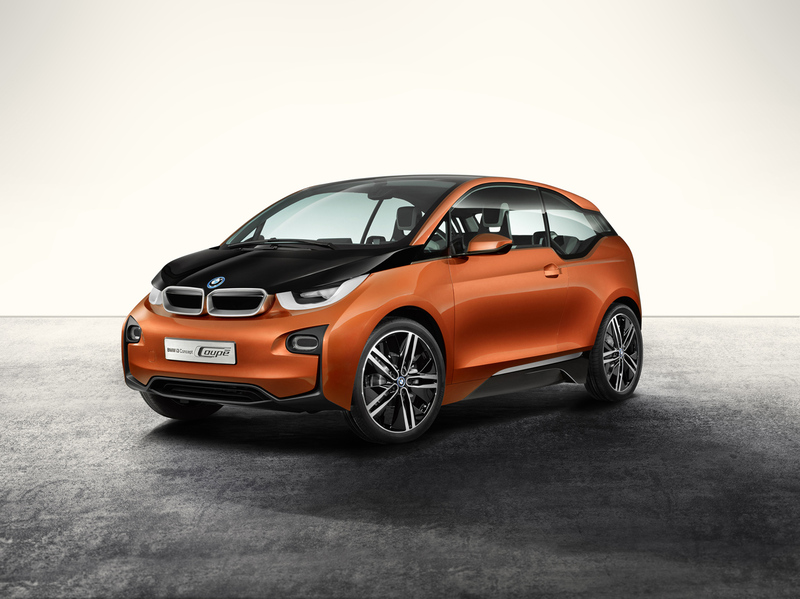 The BMW i3 Concept Coupe helps the driver to optimise efficiency by choosing an appropriate vehicle set-up. The Driving Experience Control switch on the centre console can be used to select the three driving modes, COMFORT, ECO PRO and ECO PRO+. 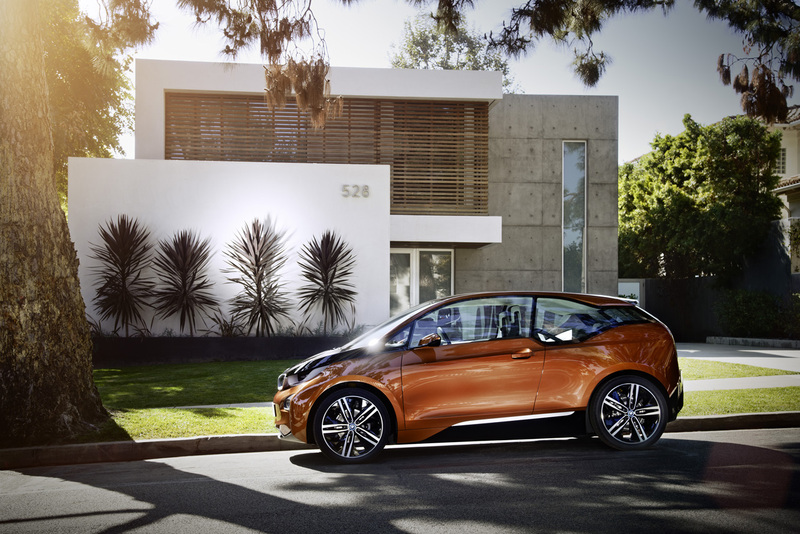 The sportiness and comfort of the BMW i3 Concept Coupe can be best experienced in the standard COMFORT setting. ECO PRO mode places the focus more on economical energy management for an increased range and even cleaner performance. The accelerator mapping is modified, for example, so that the same pedal travel delivers less power. At the same time, the heating and air conditioning are switched into a more energy-efficient operating mode. Changing from COMFORT to ECO PRO mode can extend the vehicle's range by as much as 20 per cent. Efficiency can be boosted yet further in ECO PRO+ mode, which is designed to do everything possible to maximise driving range. So, not only is the accelerator mapping modified, maximum speed is also limited to 90 km/h (56 mph). Comfort functions such as the heating and air conditioning are furthermore run at the minimum level required to prevent the windows from misting up, for instance. Electrical consumers like the seat heating, mirror heating and non-essential components of the daytime running lights are even switched off completely. As a result of all this, more miles can be added to the vehicle's range. Total networking thanks to BMW i ConnectedDrive with specific functions. The BMW eDrive system fitted in the BMW i3 Concept Coupe is designed to allow the vehicle to cover a distance of around 160 kilometres (100 miles) on a full battery charge before it has to be plugged into a charging station again. This range comfortably allows it to be used for more than just urban mobility. 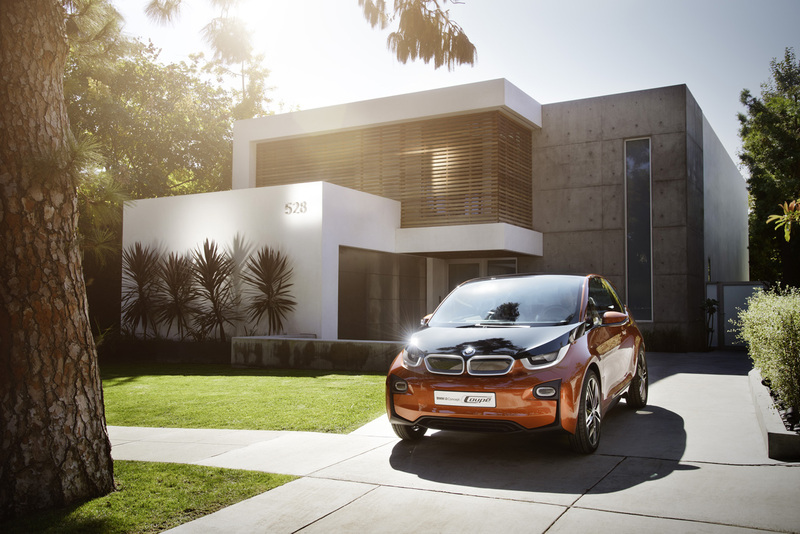 Thanks to the BMW i ConnectedDrive services that were purpose-developed for electric mobility applications powered by BMW eDrive technology, the driver receives realistic estimates of his vehicle's current range, which can be viewed even before setting off. 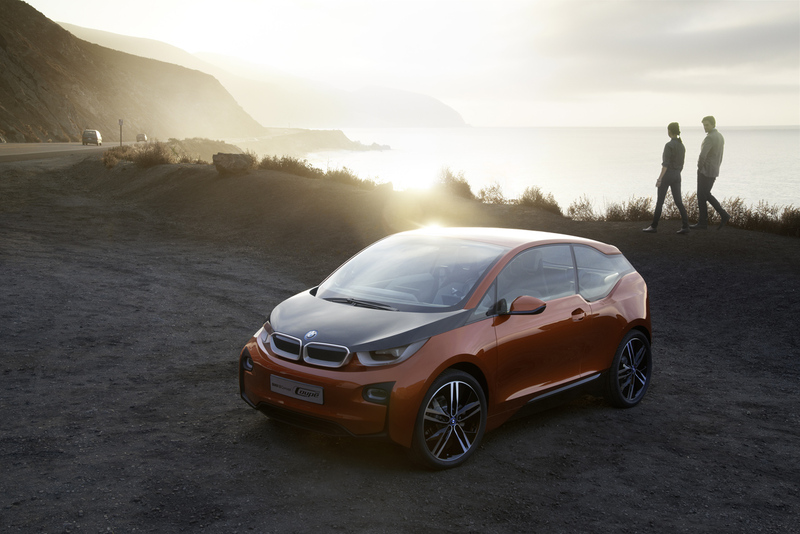 The BMW i3 Concept Coupe therefore assumes the title of the world's first fully networked electric vehicle. Precise, reliable, realistic: driving range display in the navigation system with BMW i ConnectedDrive services. 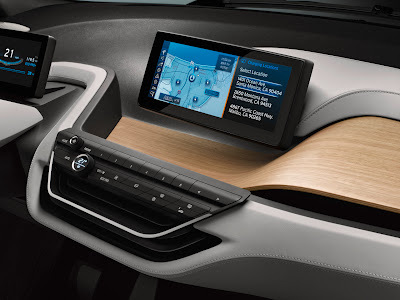 The BMW i3 Concept Coupe is equipped with a navigation system featuring BMW i ConnectedDrive services. Both the navigation system and the BMW i ConnectedDrive services have been carefully tailored to the specific demands of electric mobility. Apart from the route guidance function, the system also offers drivers assistance with their mobility requirements that extends beyond just the journey planning. One of the key elements of the networked navigation unit is a dynamic range display, which delivers precise, reliable readings by factoring in all relevant variables. The battery's charge status, driving style, activity of electric comfort functions and the selected driving mode are all taken into account for the calculation, along with the route's topography and current traffic levels. The system is therefore able to make allowance for the extra energy used up for both an upcoming climb and stop/start traffic or traffic jams, and lowers its range calculation accordingly. Up-to-the-minute and detailed real-time traffic data is also added to the equation. The information is analysed and evaluated centrally by the BMW ConnectedDrive server that stays in permanent communication with the vehicle thanks to its built-in SIM card. The SIM card's fixed installation ensures an optimum connection at all times throughout the vehicle's life. The dynamic range display is visualised on the vehicle's central information display not only as a figure but also as a peripheral contour within the navigation map. Taking the vehicle's current location as a starting point, all points that can be reached with the available energy reserves are joined up to form a peripheral contour. Since the driver is able to actively influence the vehicle's energy consumption and therefore its range by switching the driving mode, the graphical representation of the range calculation is always made available in two variants, allowing the driver to view the relevant current range regardless of whether the COMFORT, ECO PRO or ECO PRO+ mode is selected. When route guidance is activated, the driver is given a precise and true-to-reality indication of whether the destination is within range and how much energy he has to spare. The most efficient route is also shown as an alternative to the fastest. If necessary, the Range Assistant will even recommend changing to ECO PRO or ECO PRO+ mode in order to increase the range. This function clearly demonstrates the interaction between the tailored route guidance for electric vehicles from BMW i ConnectedDrive and the special energy management from Efficient Dynamics. If desired, the driver is able to call up a charging station near to his destination and reserve it with another push of a button. The system additionally notifies him of the charging time required before commencing the return journey or the onward journey to the next destination. The wealth of functions offered by the navigation system with BMW i ConnectedDrive services makes it possible to plan out journeys using electric power alone with supreme precision, reliability and convenience. Intelligent networking simplifies mobility planning: a smartphone app with eRemote function developed by BMW ConnectedDrive for BMW i. The mobility planning information provided is made available on the customer's smartphone as well as in the vehicle courtesy of a smartphone app for the iOS and Android operating systems which was specially developed for BMW i. The app is a further development of the eRemote functions from BMW ConnectedDrive and offers the driver constant access to the vehicle data and relevant route planning information. 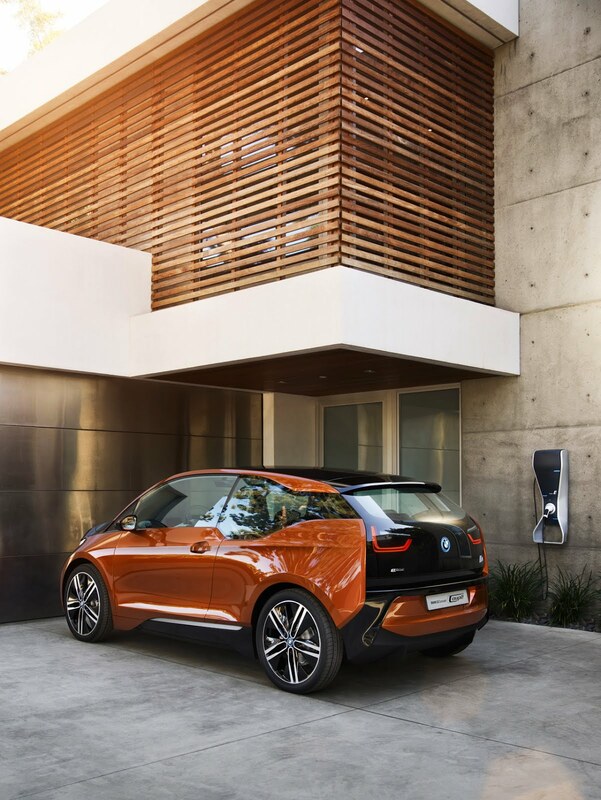 Thanks to this intelligent networking, customers are able to check the vehicle's status or plan out upcoming journeys in the BMW i3 Concept Coupe from the comfort of their office or even over breakfast. 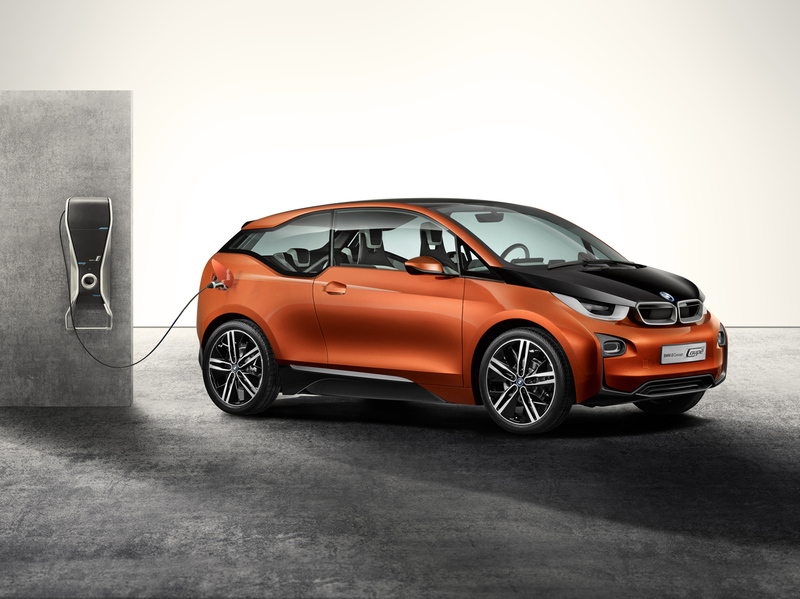 If the vehicle is plugged into a public charging station or the BMW i wallbox, the charging procedure can be controlled both remotely and via a timer function. The range display shown in the BMW i navigation system can also be viewed on the smartphone in exactly the same format as in the vehicle. The BMW i app can additionally be used to search for and select either a navigation destination or a free charging station and then import it to the vehicle's system. Available charging stations are indicated in both the navigation unit and the BMW i app, which also show whether the stations are currently free. When the customer leaves the vehicle at the journey's end, he can furthermore use the pedestrian navigation function built into the BMW i app to guide him to his final destination. For this, the navigation destination selected by the driver in the vehicle is automatically transferred to the BMW i app via the BMW ConnectedDrive server. The route planning function that was specially developed for BMW i and the specific requirements of urban centres also includes local public transport networks, allowing the available transport connections to be taken into account if required. This gives the driver the option of selecting an intermodal route in his BMW i car, whereupon he is first directed to a public car park by the navigation system. After leaving his vehicle, he now uses the BMW i app to guide him first to the correct bus or tram stop and then on to his destination while completing the final leg of the journey on foot. In addition to this, BMW i also offers pioneering mobility services that can be incorporated into the customer's mobility planning. These include the premium car-sharing service DriveNow, which has been available in Germany since 2011 and, since September 2012, in San Francisco as well. It was here that the ParkNow facility was also introduced as a world first, enabling parking spaces to be booked via a smartphone app. ParkNow and other services are provided to the customer via BMW ConnectedDrive and made available to use in the navigation system.